Woodshed Roasting Company is proud to offer you the best coffee accessories to go with your fresh locally brewed coffee. Our gifts and accessories, such as our clever coffee dripper, are sure to enhance the quality of your coffee and will put a smile on everyone’s face that you give it to. Browse our selection below and if you have any questions please feel free to contact us at sales@woodshedroast.com. We are always happy to help. 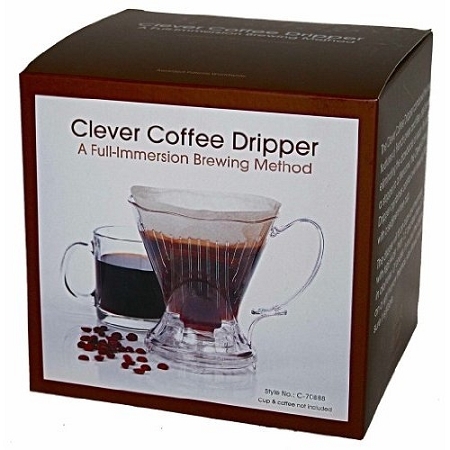 This product makes a great cup of coffee and is easy to use and clean! Water can be poured over the grounds all at one time. The shut-off valve design holds the coffee until the brewing process is complete. The filter allows for easy cleanup and prevents grounds in your coffee. 100% BPA Free Plastic.